By far, one of the most enthralling casino resort construction projects I've ever seen is the hotel tower at City of Dreams that was designed by the late great Zaha Hadid. 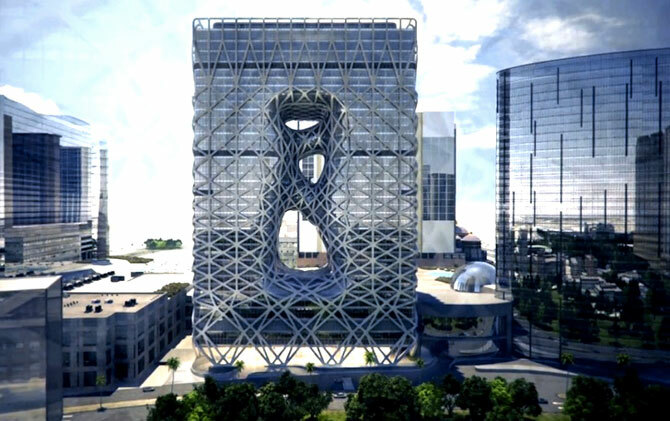 With sultry rounded rectangular shape draped in a fishnet stocking like gauze of steel, this fifth hotel tower at City of Dreams exudes mystery, wonder and sensuality. How the hell are they going to build that? Thanks to Flickr user Tim, we can take an extended peek inside the construction of this amazing project and explore the details of its interiors only weeks after it topped out. Tim's photostream contains close to 100 photos of the interior of the hotel starting with a a view looking down on the hotel lobby and ending up in the hotel's rooftop pool. "City of Dreams Phase 3 - Hotel D" will feature 618 standard rooms (55.5 sq m), 35 mini suites (79sq m), 118 Suites (104 sq m), 4 villas with swimming pools on the 40th floor (346 sq m), 4 duplex villas on the 41st floor (594 sq m) and a "gambling saloon" on the 42nd floor. The hotel will be wrapped in almost 8000 panels of curtain wall brackets.... every single one of which is unique in shape and structure. Big thanks to Flickr user Tim for sharing his photos and to Hunter for sharing this amazing find.